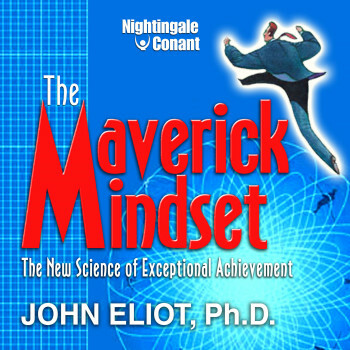 In The Maverick Mindset, renowned elite performance consultant Dr. John Eliot reveals everything he has learned about how the truly exceptional achievers in this world have - and HAVEN'T - attained their exalted heights of accomplishment. The Maverick Mindset will show you how extraordinary achievement really happens and arm you to get there yourself, so that YOU can start experiencing success on that exceptional level as soon as possible, and keep on experiencing it for the rest of your life. Discover the radically different principles and practices that set truly exceptional achievers apart from the rest! While most people are busy goal setting, visualizing success, trying to get in the flow, and doing all the other things they've been convinced will bring results they're looking for, the world's most exceptional performers - from billionaire CEOs to world-renowned surgeons to Olympic athletes to Grammy-winning rock stars - are doing NONE OF THEM. These mavericks have bucked the standard "success system" in favor of a radically different model of thinking. And, they're living better, earning more, and achieving at the highest levels. Turn stress and pressure into a personal advantage. Radically change how much you get done while actually needing less time during the work day - a shift in thinking you can make immediately. Focus like Ted Williams or Tiger Woods. Distinguish the important from the unimportant in any given situation so you can concentrate only on information that will bring you the greatest return on investment. Be the Socrates of your business. Pull yourself out of a slump or lapses in confidence; never have them again with a succinct and extremely potent seven-word philosophy. Reframe your self-image in a way that will completely transform you. The Maverick Mindset will show you how extraordinary achievement really happens and arm you to get there yourself, so that YOU can start experiencing success on that exceptional level as soon as possible, and keep on experiencing it for the rest of your life. John Eliot, Ph.D., is an award-winning professor with expertise in business and psychology. He is on the faculty are Rice University, and an adjunct professor at SMU Cox School of Business Leadership Center and the University of Houston. In 2000, he co-founded The Milestone Group, which provides performance consultation, evaluation, and training to business executives, professional athletes, and corporations nationwide. Dr. Eliot's clients have included Merrill Lynch, Goldman Sachs, Adidas, NASA, the United States Olympic Committee, The Texas Medical Center, The Mayo Clinic, M.D. Anderson Cancer Center, Little League Baseball, and hundreds of elite individual performers.